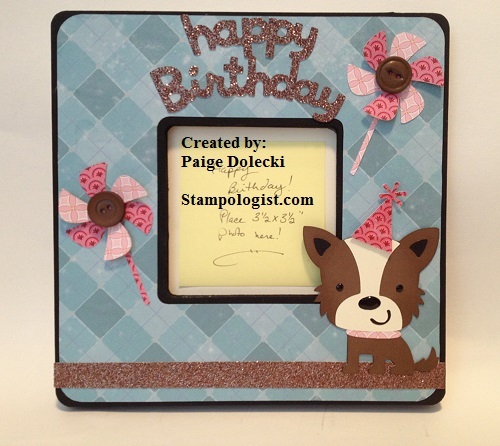 This cutie patootie puppy frame is a gift for one of my kids to give to a friend for her birthday. I love using the Michael's $1 picture frames and making them into something special as a keepsake of the party or the day. Our Glitter paper was the perfect accent along with some pinks from the Chantilly paper pack. The blue background is our long retired Wonderland paper. I used Create a Critter to cut out the decorations for the frame. This one got a resounding "awwwwww" from my daughter so I hope the girl this is meant for likes it as much! 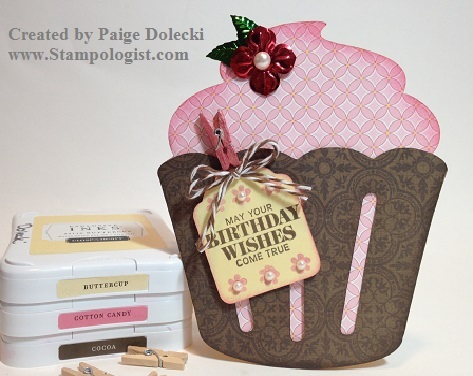 I'll be pairing this up with the Chantilly cupcake card I made last week. for a nice gift set. Hope you are having a fabulous weekend! We are getting rain all weekend after a gorgeous sunny week. My morning walk turned into quite a moist experience so I'm hoping the sunshine comes back again on Monday. The joke out where we live is how do you know its a Monday? Because the sun is out again. Seriously, I don't know why but we get a whole lot of crappy weekends after beautiful work week weather - just so unfair to the kiddos! PS - I'm adding this one to the Heart2Heart Challenge "Button it Up" from last week. Don't you love it when you use your stash, make something cute AND get to submit a new piece of art for a challenge site? Thanks Carol! She did like her picture frame so once again our paper crafting habit comes to the rescue at gift giving time!